Garlic smashed potatoes are an easy side dish requires simple ingredients. 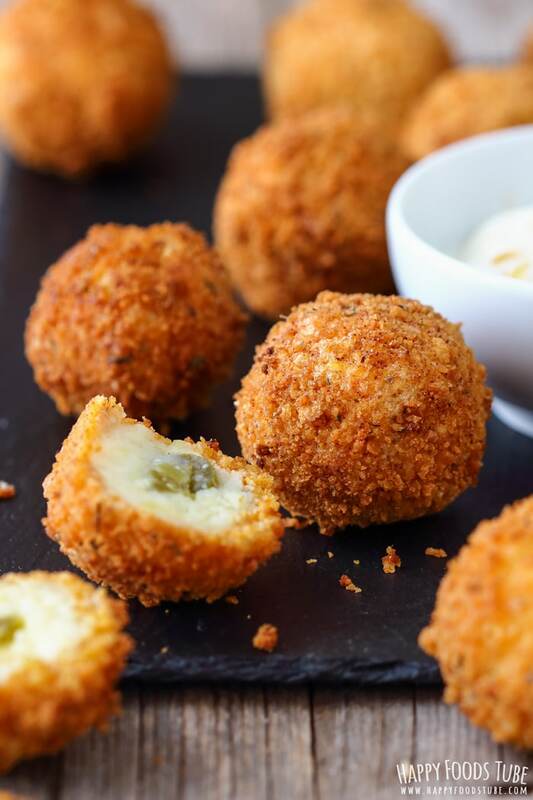 Seasoned to perfection with garlic, olive oil and herbs, they are everyone’s favorite! Also suitable for vegans! Guys, today I decided to show you how to turn potatoes into a delicious side dish – garlic smashed potatoes! 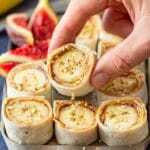 They are easy to make, only require simple ingredients (mostly from the herb and spice section) and taste amazing. Now I like potatoes but when I order a dish in a restaurant and I get plain boiled potatoes as a side, this disappoints me so much! Plain boiled potatoes just don’t taste nice. Especially, when they are under-seasoned! And that is why I want to show you what you can do with them. And it does not stop at garlic smashed potatoes! 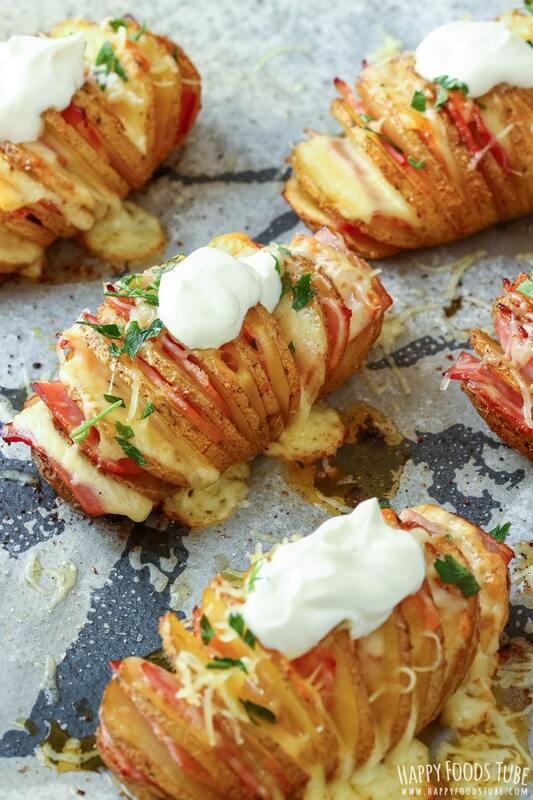 Potato Salad, Loaded Hasselback Potatoes, Twice Baked Potatoes – they all are delicious. I think, crispy garlic smashed potatoes are one of the easiest recipes when it comes to preparation and ingredients. You can make them on grill or in the oven. The choice is yours. When I am super-lazy I just throw them into our tiny indoor contact grill and they are done in minutes! Is there a difference between smashed potatoes and mashed potatoes? Definitely! Mashed potatoes are cooked, mashed and usually combined with butter and milk to get a creamy consistency (in Ireland, kale and spring onion are also stirred in and it’s called Irish Colcannon). Smashed potatoes are cooked whole baby potatoes that are then placed onto a baking tray, slightly smashed and baked until crispy. These can be seasoned to your liking. My favorites are garlic smashed potatoes. Wash the potatoes thoroughly. This step is important. The potato skin stays on so make sure to remove all the dirt. Scrub them, if needed. Also choose baby potatoes for this recipe. Now you need to cook them. I prefer using a wide-bottom pot. It’s better if you could fit all of them next to each other instead of stacking some of them on top of each other. This way it takes less to bring the water to a boil (take this as a tip not a must-do). Now no matter how many potatoes you are boiling, don’t over-fill the pot with water. You just want to add enough water to cover the potatoes. That’s all. Now cover the pot with a lid and put the stove on high. When they are boiling, reduce the heat to medium-low. Cook them until they are soft on the inside. I insert a wooden skewer inside to check how cooked they are. If it goes in easily, they are ready. Once cooked, place them onto a baking tray, smash each one of them and bake until ready. At this stage I only use a little olive oil, salt and black pepper to season them. They will need about 20 minutes in a preheated oven. When done, spread some minced garlic over, season them with paprika, dried oregano and drizzle with little olive oil. Taste one and add more salt and pepper, if needed. 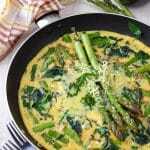 I like sprinkling them with chives but you can also use finely chopped parsley, if you like. 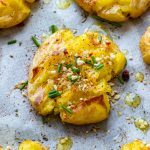 These garlic smashed potatoes can be served with anything you like (e.g., steak, Grilled Turkey Kabobs or Vegetable Foil Packets, if you are a vegetarian or vegan). How do you smash potatoes? 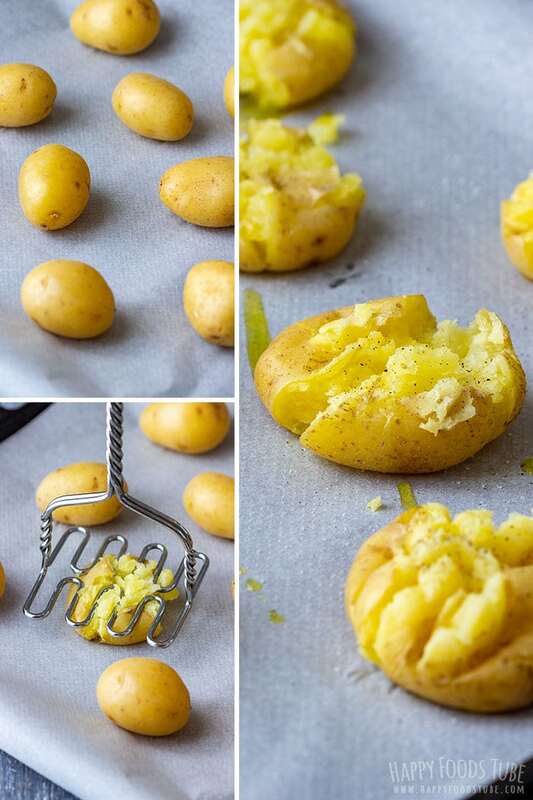 You can use a potato masher or a fork to smash them. What type of potatoes is best for making smashed potatoes? This depends on your preference and also on what is available in your local store. They will be smashed so it does not really matter what type you use. I would choose the ones you like. Don’t forget to add salt to the water when boiling the potatoes. In my opinion, nothing is worse than a under-seasoned potato. The cooking time might vary slightly. This depends on the size and type of your potatoes. In general, count with 15-25 minutes. My potatoes take about 20 minutes to bake in a preheated oven (top rack). 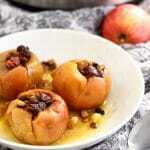 However, you can bake them for a longer period especially if you are after a crispier look. 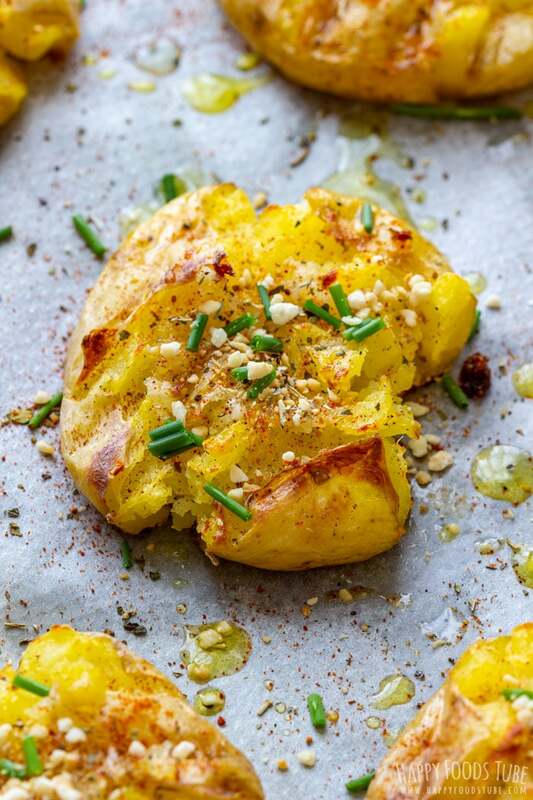 Sprinkling these garlic smashed potatoes with Parmesan or Pecorino adds a ton of flavor so if you have some on hand, go ahead and use it. 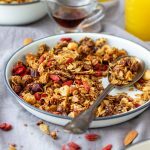 To add an extra crunchiness I pan-toasted almonds that I run through a food processor until I got crumb-like texture. 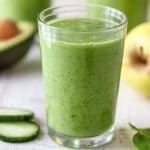 This is completely optional but it is a delicious addition to this recipe. 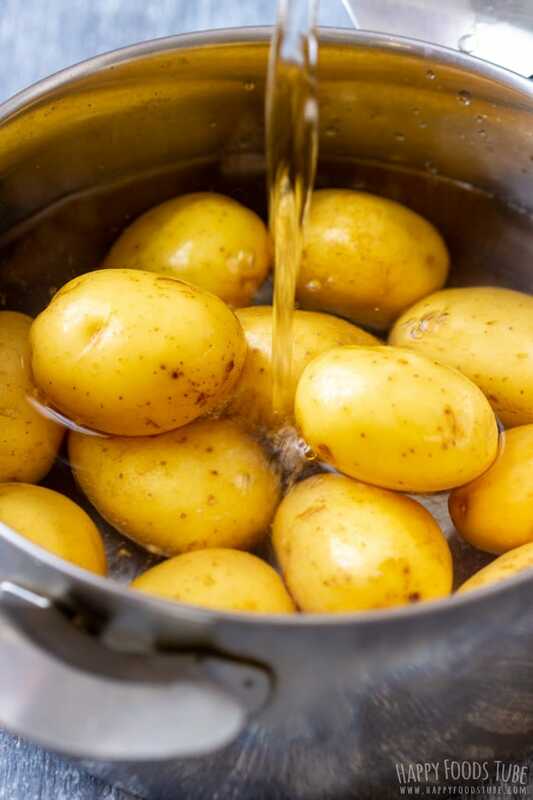 Wash the potatoes thoroughly under running water and place them in a large pot. 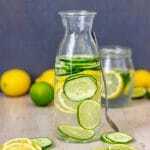 Pour in water so that they are submerged but don’t over-fill the pot with water. They will cook faster. Add 1 tbsp of salt. Cover with a lid and bring to a boil. Reduced the heat to medium-low and simmer until they are soft. Meanwhile: Preheat the oven to 400°F/200°C. When the potatoes are cooked, drain the water and place them onto a baking tray. Smash them with a potato masher or a fork. Drizzle some olive oil over and sprinkle each one with salt and pepper. Bake on top shelf for 20 minutes or until they are crispy. Prepare the garlic “spread” by combining about 2 tablespoons of olive oil with minced garlic cloves. Mix well. Spoon a bit of the garlic “spread” onto each potato and spread it around. Sprinkle with paprika, dried oregano and finely chopped fresh chives. Add more salt and pepper if needed. Optional but recommended: While waiting for the potatoes to be baked, run some whole, skinned almonds through a food processor until crumb-like texture. Throw them onto a dry frying pan/skillet and toast them for about 2 minutes or until golden brown. Sprinkle these over each potato. 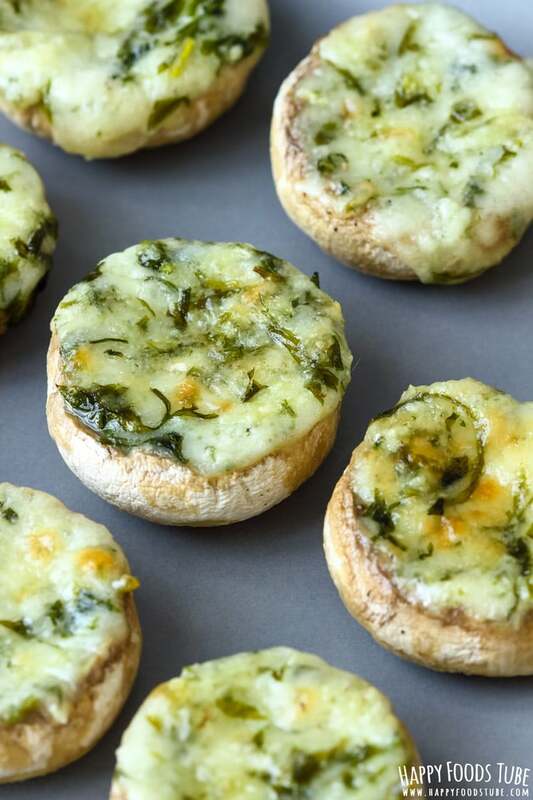 Serve as an appetizer or side dish while still warm. Use a wooden skewer or a fork to see if the potatoes are done (just find the largest potato and pierce it, if it goes easily in, they are ready). Extra virgin olive oil can be substituted with a regular olive oil. I don’t recommend using vegetable nor sunflower oil. If you don’t have olive oil, you can use real butter instead. If you have smoked paprika, feel free to use it. Optional: Top each warm potato with little butter. This will melt and create an extra rich flavor. For more tips check out the blog post. 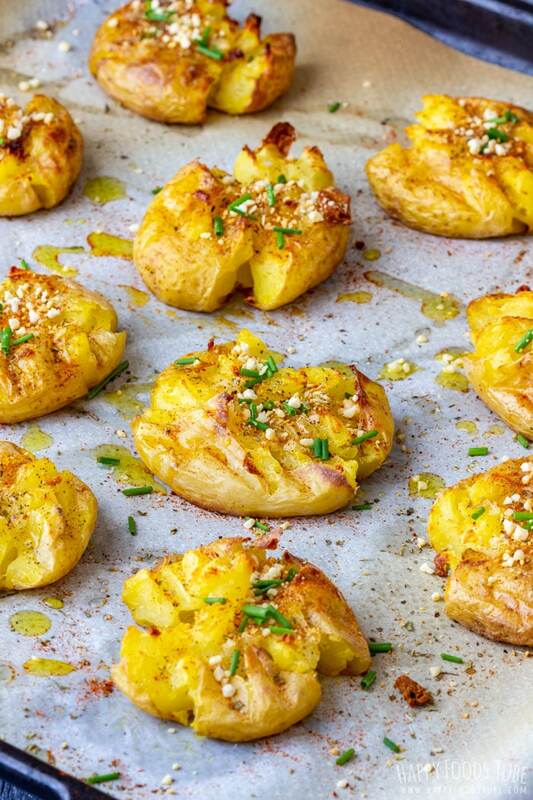 I love the way the edges of the skin get browned and crisp with smashed potatoes and these look delicious. Not sure if this was intentional, but I noticed you didn’t list garlic in the list of ingredients (though it does show up in the instructions). No it wasn’t intentional :). Thanks for catching that mistake.It’s fixed now! I love smashed potatoes and would have never thought to add the almond topping! Need to give this a try. 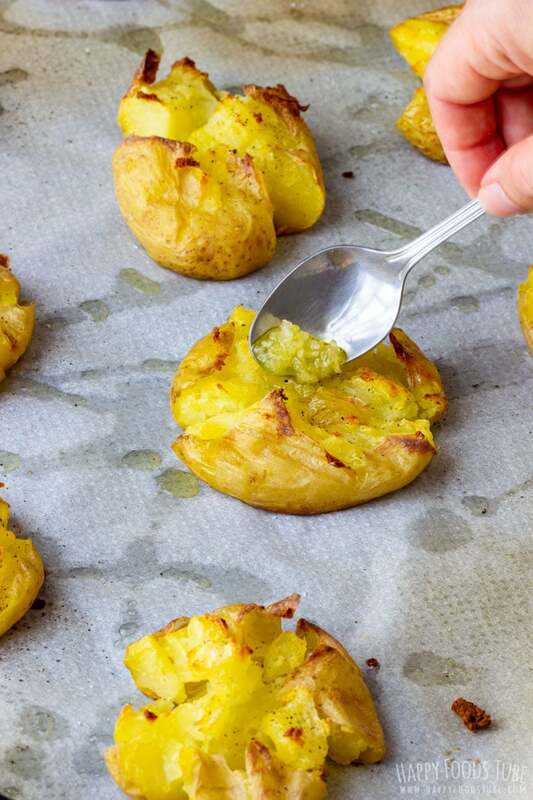 I love the crunch that topping adds to these potatoes! Let me know what you think if you do give it a try! 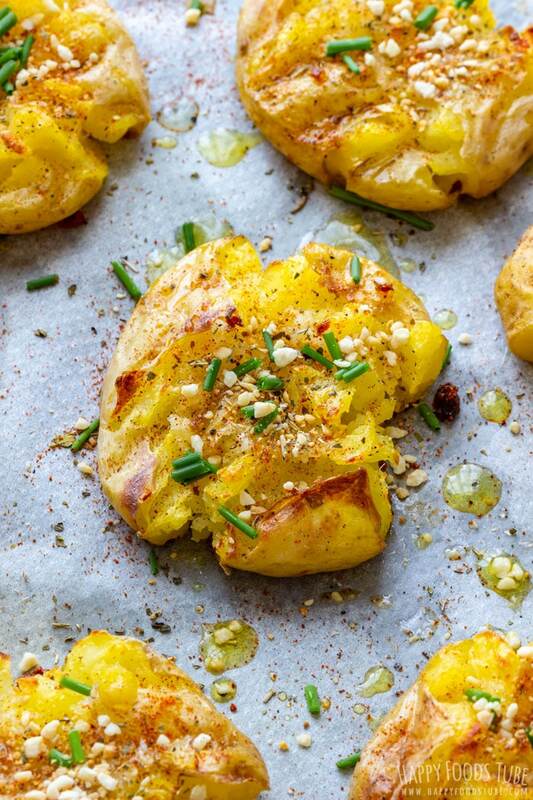 These potatoes look delicious and love the crisp on the edges. I’ll be making these in the future. Smashed potatoes are so fun! And I always love the extra “crispies” you inevitably get…super bonus! These look beautiful and are giving me all the cravings. Just pinned! Those smashed potatoes look positively luscious. I think my willpower would absolutely crumble around them.